Our CEO, Brad Downs recently shared SRM’s key fintech trends for 2019, with a focus on items that banks and credit unions should factor into their near-term planning. 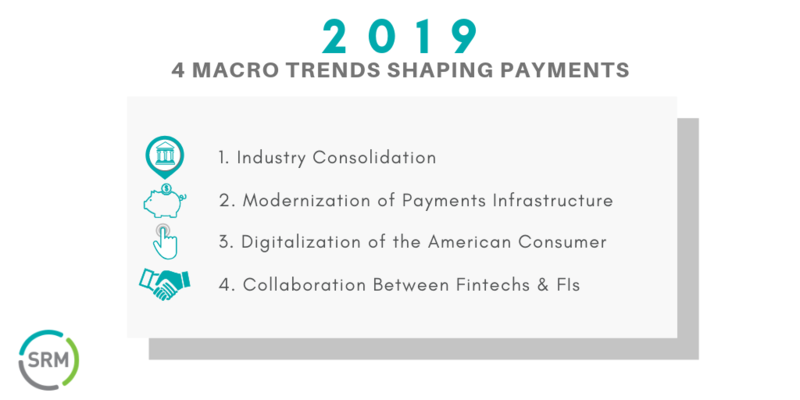 Allow me to build upon those by looking more specifically at payments trends while also applying a broader time horizon, isolating the macro-level developments that have been underway for some time and continue to shape the industry. The first trend, industry consolidation, is evident to anyone who looks at the steady but significant decline in the number of US financial institutions. At least 320 financial institution mergers have been completed in each of the past four years, and their rate and size are both increasing. Deal rationale has long centered on the need to get bigger - fast - to compete with the national nameplates as well as to realize cost efficiencies over a larger base of business. The stated reasoning behind recent transactions is evolving, however, with more executive teams citing increased digitalization and advancements in areas like artificial intelligence and robotic process automation as factors driving business combinations. This points to another key trend, the modernization of the US payments infrastructure. The new era of customer empowerment and anywhere/anytime banking requires a more flexible backbone than the legacy COBOL models supporting many financial institutions are able to accommodate. The advent of agile development methodologies, APIs and micro-services have made the path to the modern world more navigable, but a back office overhaul remains a huge and scary proposition; one that can derail a career if it goes badly. Before shying away, however, leaders should consider how much longer they want their banking career to last. Not having a competitive platform may well shorten that runway. Another trend that has been building for some time is the increasing digitalization of the American consumer. A 2018 Visa study indicates that one-third of Americans already have six or more connected devices. The recent mass adoption of voice assistants like Amazon Echo and Google Home (in addition to the existing stack of phones, tablets and laptops) has sped this process. One major consequence is that consumers are increasingly relying on these devices to drive their payment behavior. E-commerce is slated to surpass $1 trillion by 2023, nearly a fifth of total US retail spending. Payments continue to migrate away from physical stores, and away from our physical wallets. Meanwhile, banks and credit unions are still expected to stand ready to serve their customers wherever they choose to transact. Fortunately, the daunting challenges behind executing a digital banking strategy are eased somewhat by our fourth and somewhat more recent trend: a growing spirit of collaboration between financial institutions and fintech firms. Significant investment dollars continue to flow into fintech startups and rapidly growing challengers. However, nearly all of these firms are focused on improving the banking experience, not creating a new one. There’s an increasing realization by both sides that these two camps need each other- with financial institutions providing a practical on-ramp to mass adoption, a steady source of funding, and a much-needed compliance backbone. Meanwhile, fintechs can deliver digital expertise and accelerated development of new solutions - unfettered by the constraints of a large organization and the need to support a valuable installed base. The Bottom Line: Make no mistake, fintechs do pose a threat to the legacy banking model. However, the main threat comes from traditional players ignoring them and being reduced to a commoditized back office role as a result. The trick is to engage with these competitors in a constructive fashion, positioning one’s own enterprise for go-forward success in the process.